This filling, rich and flavoursome vegetarian curry ticks lots of boxes for me in regards to optimising the diet. It’s ingredients are supportive of health from a number of angles, including digestive wellness, hormone balance and immune support. I love the nuttiness of this dish; it makes it so satisfying! Cauliflower is a cruciferous vegetable, and lots of my clients are tasked with working towards a target amount of this family of vegetable every day. This is because of the known benefits of cruciferous vegetables including their help with the safe management the hormone oestrogen (which is important if you have any kind of hormonal issue or inflammatory condition). Chickpeas, which are a common component of the Mediterranean diet, provide a source of vegetarian protein, but in addition to this their specific fibre content is very helpful for supporting a diverse microbiome; needed for your digestion and immune system to function well. Heat the coconut oil on a moderate heat in a large pan on the stove until melted, then add the onions and gently fry until soft and translucent. Add the chopped garlic, peanut butter, curry paste and tomato puree, stirring everything together and gently cooking for a couple of minutes until the you can smell the aroma of the curry paste. 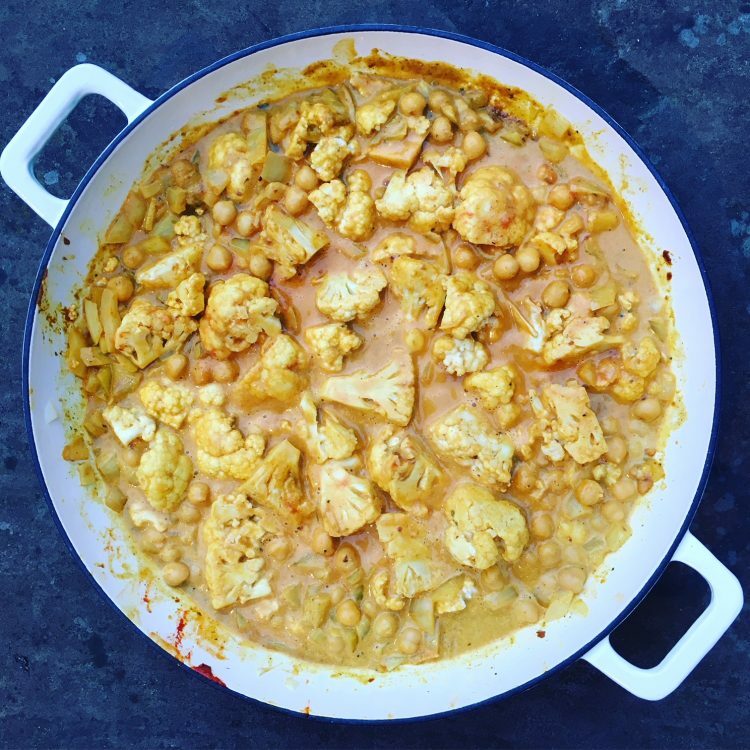 Add the cauliflower florets, rinsed chickpeas and coconut milk and stir to combine all ingredients. Cover with a lid and simmer on the stove for 15 minutes, or until the cauliflower has softened. Taste the curry and add salt and pepper for seasoning if desired (just a pinch of each should be enough). Enjoy this curry with wholegrain, black or wild rice, quinoa, or simply more vegetables! I tend to eat mine with a side portion of kale with cashew nuts which I sauté with garlic, chilli flakes and caraway seeds.